Fans of The Roman Mysteries, rejoice! This book is the first in a new series that forms a direct sequel to The Roman Mysteries. Set a few years later and aimed at slightly older readers (as you can tell from the slightly smaller type! 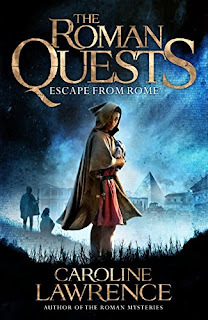 ), although this story features new, teenaged, lead characters, it also includes appearances from some of the main characters from The Roman Mysteries. While not resolved in this first volume, the series also promises to wrap up the main significant dangling plot thread from the end of that series as well. The new leads are a likeable group of children descended from an African freedman, forced to run away to Britain when the historically unpopular Emperor Domitian has their parents murdered. I liked the book's treatment of race, which is accurate to the period. Racism certainly existed in the ancient world, and we encounter it towards the end, when a rich black character chooses to keep blonde, pale-skinned slaves (including one albino) in a reaction to a white man who had kept black slaves. However, in the Roman world, status and money were far more important than race, and that is accurately reflected in the book; this also allows the story to showcase a predominantly black cast of main characters in an historical story that is not about Afro-Caribbean slavery or US Civil Rights, which seems to me to make a pleasant change (not that there is anything wrong with those stories, but they do tend to dominate, especially in the Young Adult market!). Like all Caroline Lawrence stories, the cast of characters also includes characters with disabilities, the less physical ones not well understood in the Roman world (like the Western Mysteries, this series includes a main character on the autistic spectrum). In addition to exploring how the children deal with their disabilities, the story also explores in some depth the effect such challenges can have on other children within the family, and that was nicely done, acknowledging the effect of the problem without ever implying that it was unsolvable or excessively burdensome. The story also evokes a wonderful sense of place and highlights several sites that children lucky enough to be able to reach them might like to visit - in particular, Fishbourne Palace in south-east England, and the Pyramid of Gaius Cestius, which now sits outside the train station for Ostia in Rome (as well as Ostia itself, of course, the main setting for many of the Roman Mysteries). Not being a very visual person, I always find it easier to appreciate a site when I can attach some kind of story to it, and this is a perfect way to get excited about a visit to Fishbourne! (More so than the Cambridge Latin Course, fond as I am of it!). I also really liked the chapter headings, which are Latin words - a list with translations is provided at the back. Some are guessable from context, others need to be looked up to be understood - and I confess, I had to look one up myself! (For some reason 'fax', meaning torch, not electronic mailing device, has not been a major part of my Latin vocabulary so far). They are definitely a good way to improve anyone's Latin vocabulary. At the same time, it doesn't matter if the reader doesn't understand them or doesn't want to stop to look them up - it might even help to increase the suspense not to know what they mean.